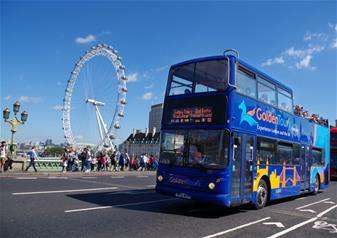 Have an exciting adventure exploring London on our open top bus tours through the city! With your 1 day ticket, you can hop-on or off at any of the 60 stops on the 3 different routes when and as you please! Taking you to the doorstep of all of the capital’s most famous landmarks, you will be spoilt for choice! From the Queen’s home of Buckingham Palace to the terrifying Tower of London, you will have the chance to discover London at your own leisure. As you journey through the city, taking in the many beautiful sights that it has to offer, you will be provided with commentary from live English-speaking guide on the Essential Route. Otherwise, there are audio guides available in eleven different languages! It’s the perfect way to get to know the city with ease, comfort and a whole load of top-notch knowledge! First stop on your fun-packed adventure to 3 of the UK’s most iconic locations is the beautiful Windsor Castle. Known as Her Majesty the Queen’s favourite royal residency, Windsor Castle is a real sight to behold. Steeped in British history, this Castle has much to offer. Venture through the exquisite State Apartments, taking in the breathtaking interior design and artwork on display. See works from Leonardo da Vinci and Rembrandt before taking a visit to Queen Mary’s Dolls House. With everything in miniature form, you will be mesmerised by the working electrics! One of the stand out highlights of Windsor Castle will undoubtedly be the glorious St George’s Chapel. See the resting place of the terrifying Tudor King, Henry VIII and his third wife, Jane Seymour plus many other British monarchs. A truly unmissable experience! Your next stop will be the world-famous pre-historic monuments of Stonehenge. Immerse yourself in the mystery around these rocks as you come to your own conclusions at how they managed to get to the Salisbury Plain 5,000 years ago and more importantly, why! This picturesque visit will be one you won’t be forgetting in a hurry! Avoid the time-consuming hunt for a restaurant and the queues with our free lunch pack! This tasty pack will give more time exploring the attractions and making important memories. Set in the beautiful English countryside, the city of Bath is known for its gorgeous Georgian architecture and its glorious Roman Baths! During your visit, you will get to explore the wonderful Roman Baths that were once used for public bathing. As a sacred hot spring, these baths will be sure to take your breath away alongside your trip to the pump rooms. Discover London by foot on one of our free walking tours! Choose between The Royal Walking Tour and The Beatles London Walking Tour for a fun-packed guided tour through the city. Discover royal secrets during your Royal Tour or where the legendary British band the Beatles made their music – a real gem to be had!